My son and I anxiously await For the Birds to appear on my iTunes podcast feed every week so we can listen to you after I pick him up from preschool. We are brand new birdwatchers — my son T.W. has recently fallen in love with birds of all kinds. He especially loves Tanagers, and was so delighted by your piece on the Summer Tanager earlier this week, he asked me to write you for him. He tells me his best bird ever is a red-winged blackbird, because on Mother's Day we went for a walk in a field, got our feet all wet, and watched red-winged blackbirds fly over our heads. Thank you so much for your wonderful show. Well, thank YOU, Ann, and you, too, T.W., for your wonderful letter! It’s especially fun that four-year-old T.W. 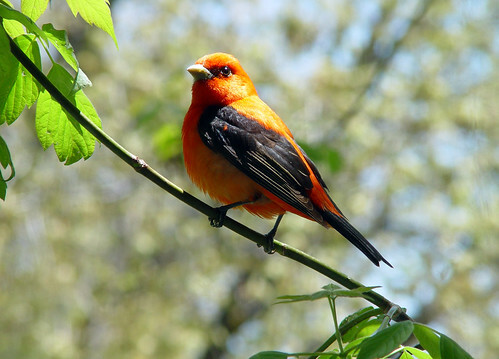 loves tanagers AND Red-winged Blackbirds, because the Scarlet Tanager could easily be named the Black-winged Redbird. The Summer Tanager in Duluth that I talked about last week is very rare this far north, but I was down in Iowa over the weekend, where I saw several. And I saw Scarlet Tanagers in Ohio a couple of weeks ago. I can sure understand why TW loves them! 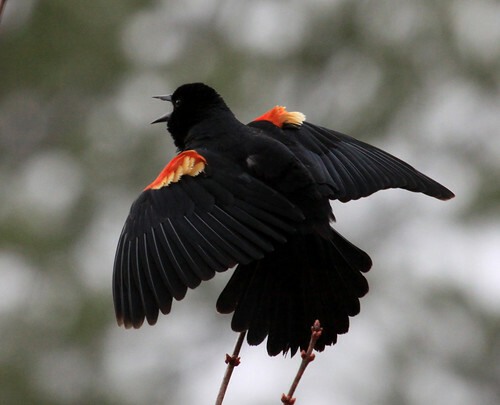 But yes, there’s something about walking in a wet field where Red-winged Blackbirds are found, getting our feet soaked as Red-wings fly over our head, that makes encounters with them exciting and memorable. Females don’t live up to the name, not being black and not having red wings, but they’re beautiful in a quieter way, and they make identification more fun and challenging because they look more like gigantic sparrows than blackbirds. 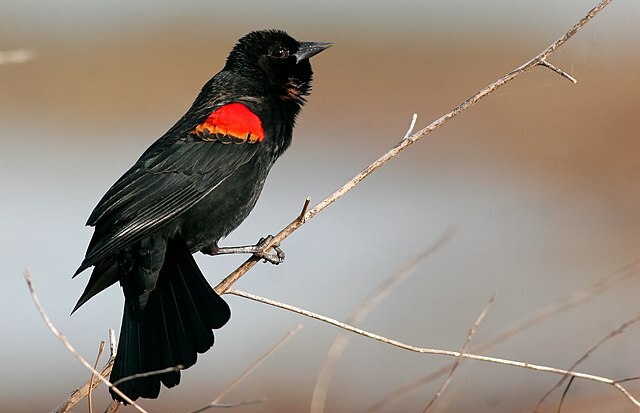 When I was a teacher in Madison, Wisconsin, I used to take my bicycle to work, which involved riding through some prime Red-winged Blackbird habitat. One morning I heard an odd, arrhythmic clicking sound. 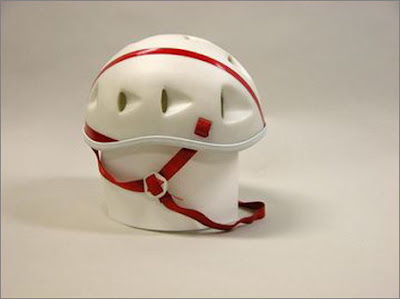 I couldn’t figure out what it was until I looked in my rearview mirror to see a Red-winged Blackbird attacking my trusty old Bell bicycle helmet, which was white with red stripes. The helmet absorbed all the shock of each impact so I couldn’t feel a thing! Red-wings notice the color red and try to chase anything with red off their territories. When I took a field ornithology class in college, one of our assignments was to map out Red-winged Blackbird territories in a small marsh by setting out study specimens—that is, dead birds stuffed in an unnatural pose with wings folded—and dead birds that had been stuffed by taxidermists to look more natural, in various places to note where they were and weren’t attacked by live redwings, and whether the natural poses made a difference. They did, but study specimens with more red exposed got attacked way more than study specimens in which the red was more hidden. 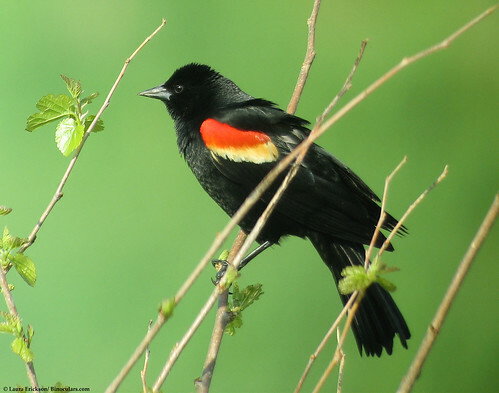 When I wrote for the website Journey North, I came up with a field study for children to try, making Red-winged Blackbird action figures to see how red-wings react. I cautioned children, parents, and teachers to only do this BEFORE redwings actually start nesting, pointing out that once they are feeding babies, it's best to leave them alone to take care of their young. Redwings are so abundant in the areas where they breed, and they live in habitat where food is so abundant, that adding a temporary new competitor in the form of an action figure won’t stress them out much if at all, as long as it doesn’t distract males from more important activities. Some children went to great lengths to make their action figures look realistic, but kids learned that ones that hardly looked birdlike at all could still elicit attacks with the right color combination. Learning how to do field work at a young age, with important caveats about doing it ethically, is a great way to help budding young scientists and naturalists see how it’s done. 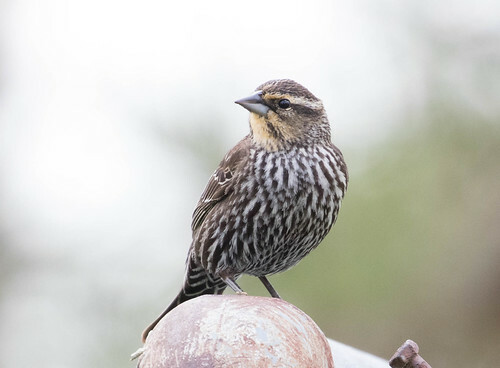 The oldest recorded Red-winged Blackbird was banded in New Jersey in 1967, and found, injured, in Michigan in 1983 when it was 15 years, 9 months old. It was released after recovering from its injuries; we have no idea how long it survived after that. Different populations of red-wings differ widely in size and body proportions. But when young from one population are moved to the nests of another population, the babies grow up to look like the redwings in their adopted population. So size and body proportion in red-wings are apparently not genetic qualities but, rather, result from the environment where one grows up. 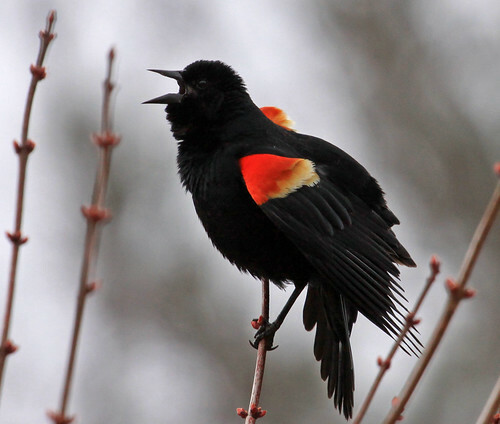 But the color of Red-winged Blackbirds results from their genetic makeup. One California subspecies is called the “bicolored blackbird” because it lacks the yellowish border on the red epaulets. This may help the birds to recognize one another better in the limited area where their range overlaps with the Tricolored Blackbird. 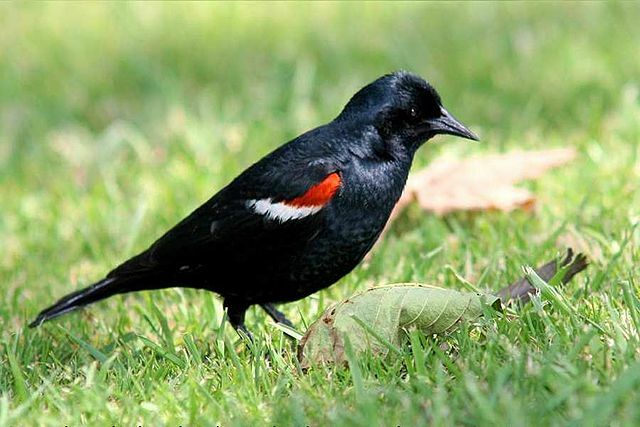 The Tricolored Blackbird could also be called the Red-winged Blackbird, but it’s an entirely different species with a whitish rather than yellowish border on the red epaulets and a different call and song. This species with the extremely limited range, found only in California’s Central Valley, is declining dangerously. Fortunately, TW’s good old Red-winged Blackbird is thriving, so he’s likely to enjoy them for many, many years to come.